When it comes to shopping for tablets this holiday season, there are two main contenders: The Nvidia Shield Tablet and the Apple iPad Air 2. Aside from both being very capable tablets, the two devices are worlds apart. Here are ten reasons why you should consider the Nvidia Shield Tablet for your gaming and movie entertainment needs. At a glance, the iPad Air 2 pulls ahead because of its larger, higher resolution, screen and slightly thinner casing. But we argue that bigger isn’t always better. The Nvidia Shield Tablet is a shade lighter (about 2oz) than an iPad Air 2. That and its narrower screen makes it easier to pack into a backpack, messenger bag, or purse. Even though the iPad Air 2 has a very impressive high-resolution Retina display, the Shield Tablet is no slouch. In fact, its 16:10 aspect ratio might be preferable to the iPad’s 4:3. You can watch movies and play games at 1080p resolution on the Shield Tablet without having annoyingly thick black bands on the top and bottom of the screen. Although the iPad Air 2 wins out with the rear 8MP camera, the Nvidia Shield Tablet evens things out by offering 5MP HDR cameras on both sides. So, Shield Tablet users can take quality photos and 1080p video no matter which camera they use, which is important when live streaming games on Twitch – something only the Shield Tablet can do directly without adapters or add-ons. Lastly, the Shield Tablet features the Nvidia Hub, which helps organize your games and entertainment apps. The Nvidia’s Tablet also has advanced features like Shadowplay, so you can always capture your best gaming moments. The 16 GB WiFi Nvidia Shield Tablet retails for $299, while the comparable 16 GB WiFi iPad Air 2 starts at $499 – a difference of $200 dollars. Even if you compare the Shield Tablet with the previous generation iPad Air (MSRP $399), you still save $100 dollars by going with the Shield. You’ll still come out ahead if you decide to pick up a Shield Controller for an additional $59.99. Other models include the 32 GB Shield tablet with LTE capabilities for $399. The iPad Air 2 doesn’t have a 32 GB model, and its 64 GB version with cellular data goes for $729. Meanwhile, the previous generation iPad Air 32 GB model with cellular retails for $579. 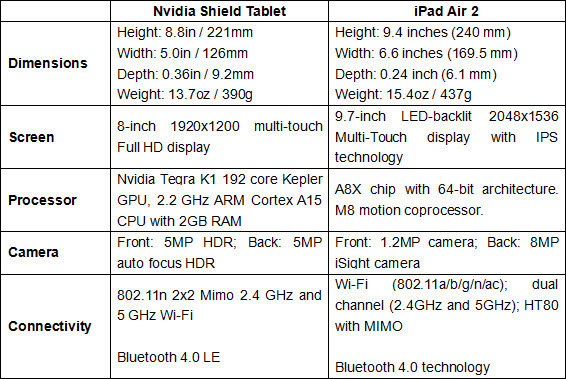 No matter how you look at it, the Nvidia Shield Tablet has the lower price tag. In order to hook an iPad up to an HDTV, you’ll need a special Apple Lightning Digital A/V Adapter, which retails for about $49.99. The Nvidia Shield Tablet, on the other hand, requires a mini HDMI-to-HDMI cable or adapter, which can range anywhere from around $7 to $30 at most for a 6′ cable. That’s a huge price difference. There’s also the matter of how some entertainment apps might not work well with the Apple A/V adapter, if at all. That isn’t as much of a concern when using the Shield Tablet, because it can be set to mirror mode. So, anything that can be seen on the tablet’s screen also shows up on the television, including images and web videos played through the browser. Also, let’s not overlook the fact that the Nvidia Shield Tablet is the only tablet of displaying 4K Ultra-HD graphics, for those that want to make the most out of their 4K HDTVs. The iTunes App Store gets top marks when it comes to its selection of games, movies, music and other entertainment, but let’s face it, the App Store is a monopoly. You can’t shop around and price compare if you’re looking to pick up an app. Your options are a little more open with the Shield Tablet, since it’s an Android device. You can choose between using Google Play or the Amazon Appstore, which gives away a free premium app every day. The selection off apps between the iOS and Android app stores are closely competitive, with most major games available for both device types. There’s also the added convenience of being able to purchase books and music straight through respective 3rd party apps (like the Kindle, Comixology, Amazon Music, etc.) on an Android tablet, which you can’t do on an iOS device because Apple wants you to stick with iTunes purchasing. Speaking of iTunes, you can only purchase items by launching the iTunes app on your computer, iPhone, or iPod Touch, or iPad. That’s fine if you’ve already committed your digital lifestyle to Apple. Those people with iPads coupled with Android phones aren’t so fortunate. Since the Nvidia Shield Tablet is an Android device, it has the added convenience of purchasing apps and media through a web browser using Google Play or Amazon. So, if you’re at a friend’s place or at a public computer, and you don’t have your phone on hand, you can still buy whatever you want without hassle. Although both the Nvidia Shield Tablet and iPad Air 2 support Bluetooth gamepads, the Shield Tablet is the only one with a dedicated controller built specially for it. The Shield Controller uses a dedicated WiFi antenna, which not only offers better responsiveness, but it leaves your Bluetooth connection free for other devices like a headset or speaker. We’re not talking about any old controller, either. The Shield Controller has a built-in headphone jack, a touch pad, and volume control. You can even map its controls to touch gestures so that you can use the gamepad for Android games. Furthermore, the Shield Tablet supports up to four Shield Controllers at once, which is great when hooking it up to an HDTV and playing multiplayer games with friends. All the games on the iTunes can’t compare to what’s available across the entire PC gaming world. You can purchase full games from digital retail sites like Steam, Origin, and GoG.com, and play them through your Shield Tablet if you have a computer with a recent generation Nvidia graphics card in it. PC games stream directly over the in-home network, remote WiFi, or over a cellular LTE connection. That means, you can take your PC gaming on the go and play from almost anywhere without compromising on graphics or having to purchase a special mobile port of the game. Even if you don’t have an Nvidia powered gaming computer at home, Shield Tablet owners are automatically eligible to use Nvidia Grid for free. Nvidia Grid is a game streaming service that is in development, and it currently has twenty PC games to choose from, which can be played for free. The iPad Air’s built-in stereo speakers have been significantly upgraded compared to previous generation mono speakers, but they are still rear facing. If you lay the iPad flat on a table, the table could absorb much of the sound. The Nvidia Shield Tablet features loud front facing dual bass reflex port stereo speakers. So, whether you’re watching a video or playing a game, the sound is pointed in your direction, not away. There’s nothing worse than spending a couple hundred dollars, then finding out that you don’t have enough memory to fit all your apps, music, photos and video. Not much of a worry if you’re using a Shield Tablet, because it has a micro-SD memory card slot. You can offload all your stuff onto a memory card and leave the main storage free for apps and games. There’s no way to increase an iPad’s storage, so hitting capacity means you’ll either have to start deleting things or buy a new iPad. If you like to draw or are one of those people who jots down notes by hand, the Nvidia Shield Tablet is the device to have. Not only does its slimmer shape make it easier to hold in one hand while writing with the other, but the tablet comes with an high-precision stylus included, along with apps like Nvidia Dabbler for drawing and JusWrite for notes. You have to buy a stylus separately for the iPad, and one that offers the same precision and quality as the Nvidia DirectStylus 2 can cost quite a bit. All this makes the Shield Tablet the go-to device for people who still like to get hands-on with their digital devices. Despite being a 6th generation tablet, the iPad Air just isn’t meant to be shared. The tablet is registered to one user, and its setup and almost everything that’s on it is accessible to anyone that picks it up. Android devices like the Nvidia Shield Tablet feature multiple user profiles, so household members can check their email and schedule their calendars without accidentally looking at yours. Profiles can be set up with different privileges, so certain people can be restricted from using certain apps. All content like photos and apps are stored away within each individual password protected profile, so you don’t have to worry about household members snooping through your stuff, and everything stays relatively organized. Tips: The NVIDIA Tegra K1 processor makes Nvidia Shield Tablet an excellent game tablet, which ensures smooth, crystal-clear game streaming. However, as its eight-inch with 1920×1200 resolutions display make Nvidia Shield Tablet an outstanding Platform for watching DVD movies and many Nvidia Shield Tablet holder are thinking that! We can talk something about DVD enjoyment on the Nvidia Shield Tablet. Although Nvidia Shield Tablet is a great tablet for playing DVD movies, unfortunately it only supports a few video formats like widely used MP4, and the movies on DVDs (VOB) are not playable on Nvidia Shield Tablet. In order to solve it, here I recommend a program named Aimersoft DVD Ripper to you, which is a outstanding tool working on ripping and converting DVD movies to Nvidia Shield Tablet supported video (MP4). View the guide to learn more detail. 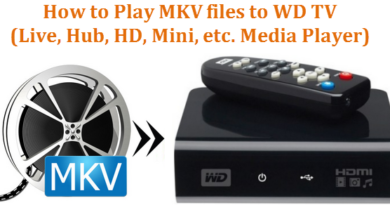 WD TV can’t Open MKV files? Why? How to Solve? Hivimoore Tell You! I like iPad Air 2!